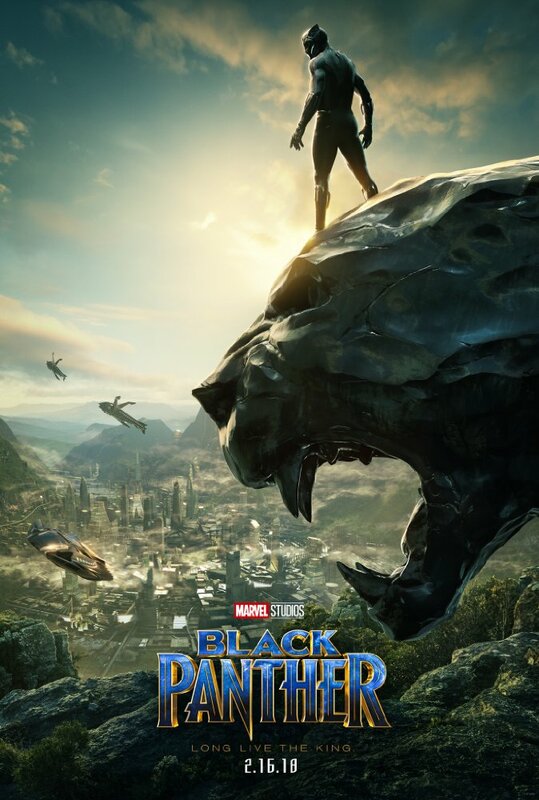 After the events of Capta in America: Civil War, King T’Challa returns home to the reclusive, technologically advanced African nation of Wakanda to serve as his country’s new leader. However, T’Challa soon finds that he is challenged for the throne from factions within his own country. When two foes conspire to destroy Wakanda, the hero known as Black Panther must team up with C.I.A. 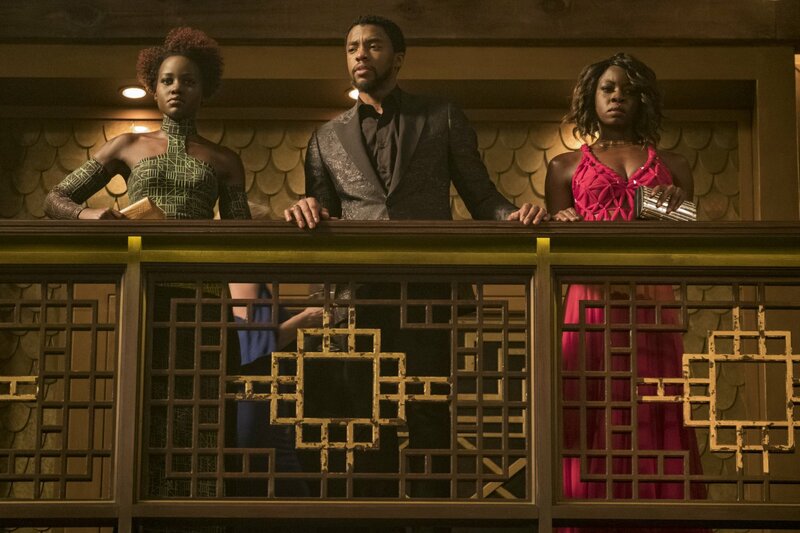 agent Everett K. Ross and members of the Dora Milaje, Wakandan Special Forces, to prevent Wakanda from being dragged into a world war. KIDS FIRST! Film Critic Willie Jones comments, “Strong black women drive this movie and give young black girls true heroes. And, they never need a cape. To top this all off, it’s one of the best Marvel films released within the ever expanding Marvel Cinematic Universe.” See his full review below. Has a superhero film, in the history of cinema, ever been so socially involved? While Wonder Woman was an important film in the blockbuster cannon, the social context about Black Panther feels a little more amped. 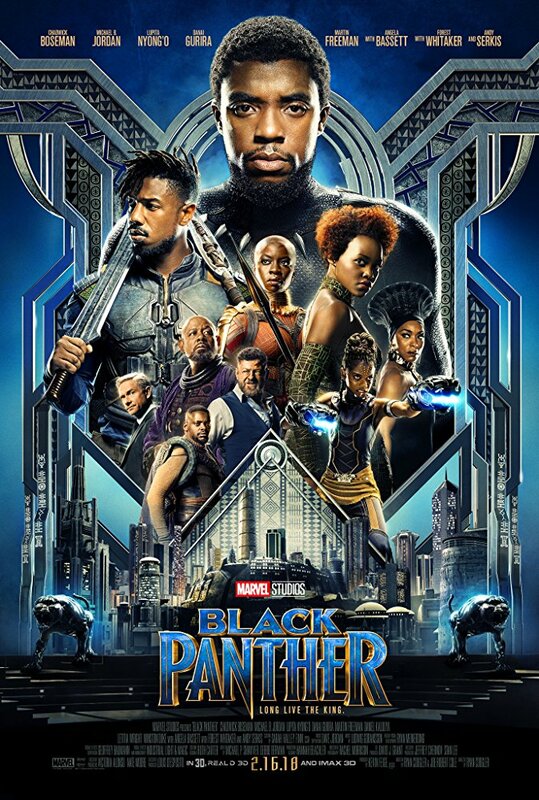 At a point in time in which race-relations are still tumultuous, and women’s rights are being re-evaluated and improved, this movie contains themes and content that satisfy and challenge the changes we all wish for Hollywood to make, and the changes we all wish for the world to undergo. Black on black violence is subtly yet powerfully addressed. Strong black women drive this movie and give young black girls true hereos. And, they never need a cape. To top this all off, it’s one of the best Marvel films released within the ever expanding Marvel Cinematic Universe. It’s well paced, well acted, well written and is very nearly flawless. The pace of this film is exceptional. Kudos to director Ryan Coolger and editors Michael P. Shawver and Claudia Castello. No scene lingers too long, no sequence halts the forward momentum. The 134 minute run time goes by in a breeze. Ryan Coolger and Joe Robert Cole write a tightly constructed screenplay that includes all the Marvel cinematic conventions without ever compromising the story. The screenplay is expertly and smartly written. It is filled with dialogue that never gets unattractively melodramatic, and every so often says something that goes beyond the screen. The issues and debates brought up in the film, particularly about sharing resources within the black community and the fine line between conflict avoidance and complacency, are brilliantly implemented. They are themes and ideas that aren’t just dumped into the movie to give it a faux social relevance, but are instead used as motivations to advance character development and feed the plot with stakes. The movie is also laced with genuine comic moments that aren’t used as relief or brought about forcefully, henceforth interrupting the flow of the movie. Any and every comic moment within the film is very much natural and stems from well timed writing and acting. Leading man Chadwick Bo seman is known for being typecast in biopics (a bit of an oxymoron). He’s known for playing Jackie Robinson, James Brown and Thurgood Marshall. Here, he brings the charisma needed to do a biopic, and graces the screen with it. He doesn’t miss a single beat, whether it be dramatic or comic. He’s all at once suave, funny, likeable, questionable, dangerous and frankly, cool. He has swagger. Supporting him is a cast made up of Lupita Nyong’o, Daniel Kaluuya, Danai Gurira, Martin Freeman, Andy Serkis, Michael B. Jordan, Forest Whitaker, and Angela Bassett. There’s no overacting. There’s nothing but an incredible chem istry. Each cast member performs with a sense of urgency. Their passion for this project is apparent and it feeds into their performances. 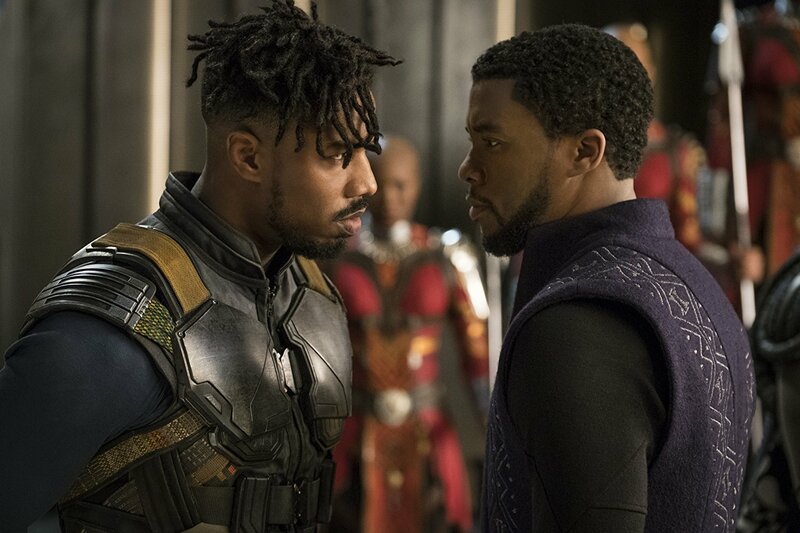 A special shout out to Michael B. Jordan, who plays a villain and doesn’t completely overdo it. Often times, we find ourselves wondering whether his intentions as the villain are actually malicious. 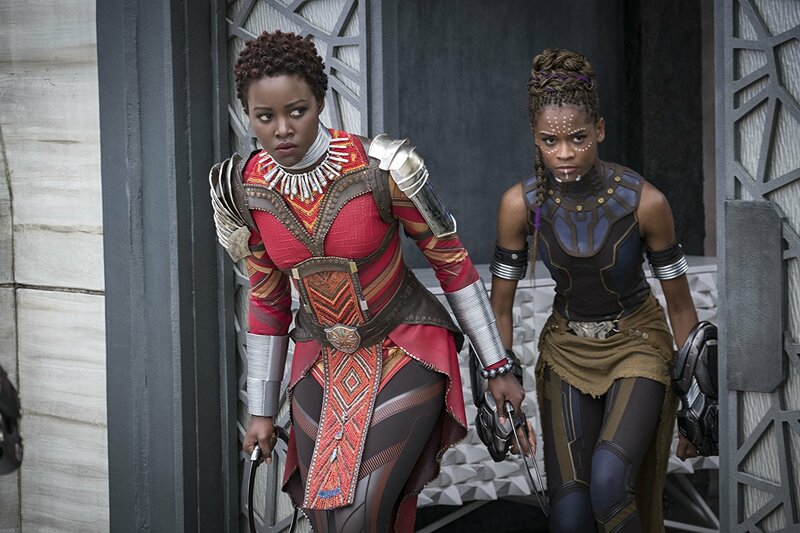 Lupita Nyong’o and Danai Gurira serve as the backbone of this movie. Their gentle ferocity is strongly alluring and their stillness accentuates their beauty while simultaneously exuding great power. Your eyes will be glued to their performances. Ryan Coolger directs this film with confidence and gives it an indelible flavor. Every directorial choice is warranted, thought through, and well executed. His use of fluidity with the cinematography gives the movie its suave feeling, which makes the moments of stillness so powerful. And there are some very striking images in this movie. Coolger makes full use of the beautiful art direction and costume design without glamorizing the aesthetic. 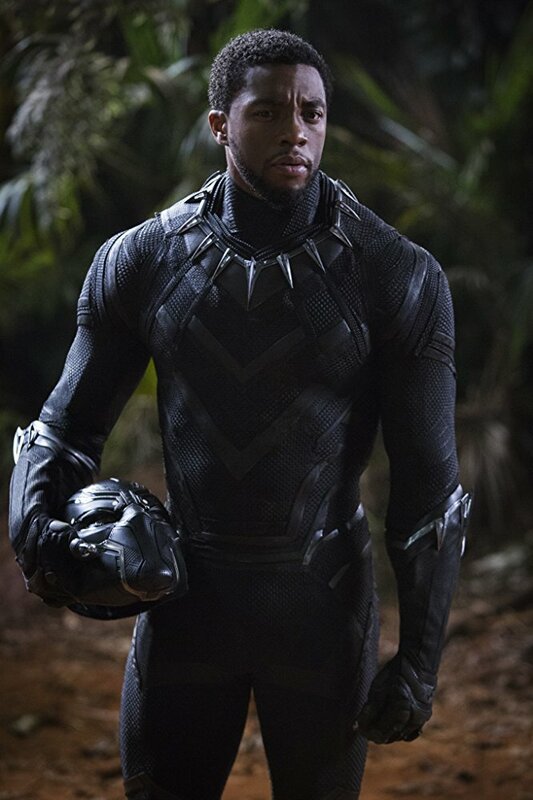 Some of the costumes in the movie are destined to be iconic, and I mean more than just Black Panther’s suit. Lupita Nyong’o is given costumes that could make her the Audrey Hepburn of the Marvel Universe. She wears her costumes with more than beauty and grace, but with total confidence. The sets and environments in the movie are more than attractive, they’re unique. 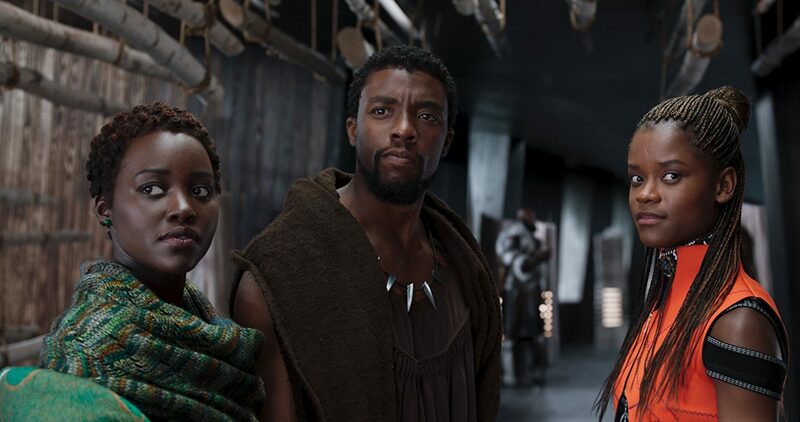 The production design firmly sets us in Wakanda, and we don’t want to leave. Marry that with Marvel’s greatest costume designed movie, and the pure attractiveness of the movie is almost in itself worth the price of admission. The soundtrack is fantastic and helps push the film along. As a matter fact, to get back to the cultural impact the film has already made, the marketing campaign was brilliant. Kendrick Lamar, a major musician, produced and wrote an album inspired by and used in the film as a sort of companion piece – kind of like an opening act to a concert. It can be heard on Spotify and I highly recommend it, just as I highly recommend this movie. I give this film 5 out of 5 stars and recommend it for ages 10 to 18. It can be seen at a local theater near you. This entry was posted on Thursday, February 22nd, 2018 at 3:56 pm and is filed under Film Critics Blog. You can follow any responses to this entry through the RSS 2.0 feed. Both comments and pings are currently closed.